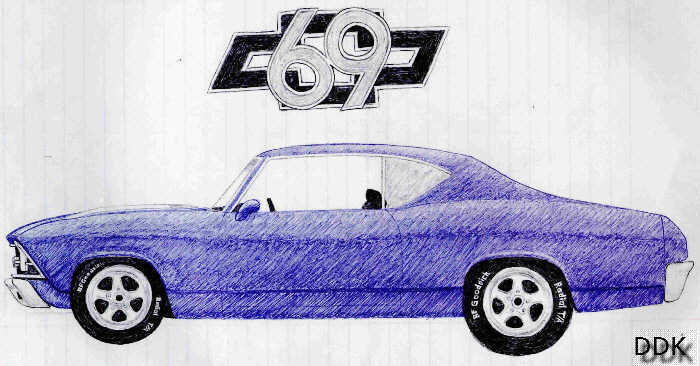 This is a drawing of my ‘69 Malibu. I currently run a stock 350/TH350 and 10-bolt 2.56:1 open differential. I am not very proud of that. Plans are in the works for a 406 smallblock/TH200 4-R and 10-bolt 3.23 posi combo. It has a black cloth bench interior, an SS hood, shaved emblems, 92-99 Buick LeSabre mirrors, Cragar Street-Stars, BFGoodrich Radial T/A’s, and (94-96 Corvette) Dark Cloisonne Met. paint with white stripes.